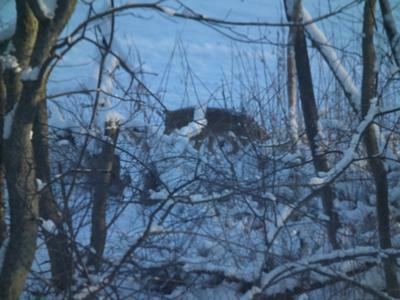 I was letting one of my dogs out yesterday around 10am and noticed movement behind my house across the ravine that borders us at the back. I quickly brought the dog back in the house and grabbed my camera and took 3 pictures. The Wolf is only visible in the two I have attached. 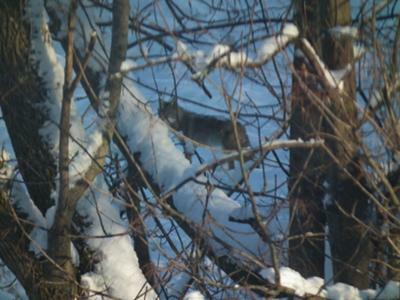 At first I thought it was a Coyote until I put the picture on my computer this morning. Three or four hours later it walked back in the other direction, as I was letting my dogs out again and one started to bark at it. It just looked our way and then kept walking. I would say it looked to be about 75 to 80 lbs because it appeared to be larger then my small Shepherd. Thank you so much for your Wolf sighting report, that is wonderful - and you took such great pictures too! Our readers will love them! Who knew there were Wolves in the Paris, Ontario, area? I'm sure I saw a Wolf on Glenmorris Road towards Paris, though I was told I was seeing things and that there aren't any Wolves this far south?